Shuffleboil, or so their called. Turns out to be the perfect name for them – sinister shuffle beats and all a-boil in furious swells and intensity. Great music from a band of players I’ve never seen before. Horvitz I know from Naked City, of course, and other Zorn projects – and Previte from a Zorn bootleg – but the whole band turned out to be dynamite. Previte is a beast. Drumming like a madman and loving every minute of it. Very unusual intrumentation – not sure I’ve heard anything set up quite like this – 3 chordal instruments and drums. 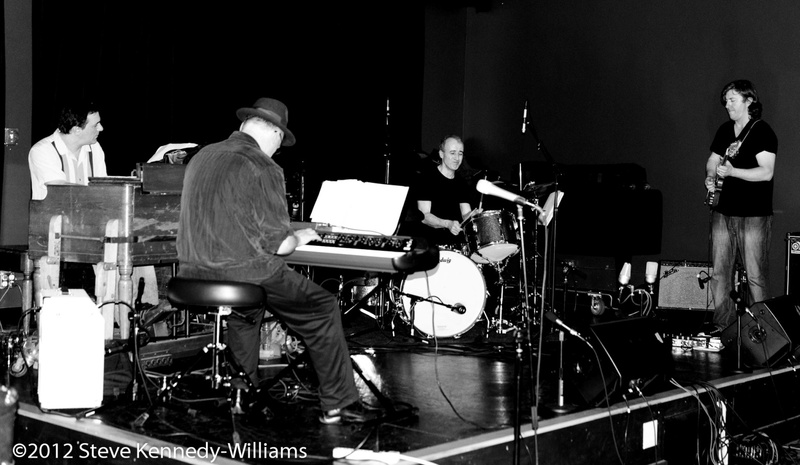 Horvitz had the Rhodes distorted to near-guitar sounds for a bunch of it – dark, dirty guitar. The sound had this cool mix – 3 dark, earthy and noisy players grinding out grooves and clusters of intensity, and the guitarist with a lighter, cleaner sound on top, nicely popping along (well – he plays some nasty guitar, lots of creative ideas and sounds, but the overall playing was almost like dancing afloat this churning mess of awesomeness). Duende is this new restaurant/music club opening in uptown – spoke with Rocco at the door and he said they are planning on having experimental jazz a couple days a week (yess!). But, this isn’t Duende, not yet. This was supposed to be their pre-opening concert, but because of construction delays, they moved it to some guys open loft downstairs from the Starline (also not opened yet) – it was at 2236 MLK. Came across the info randomly – and was unsure what the music would be. Appaerently, the chef of this new Duende place is good buds with Zorn, so we’ll see if they can keep up this style of music. Went with Gage. 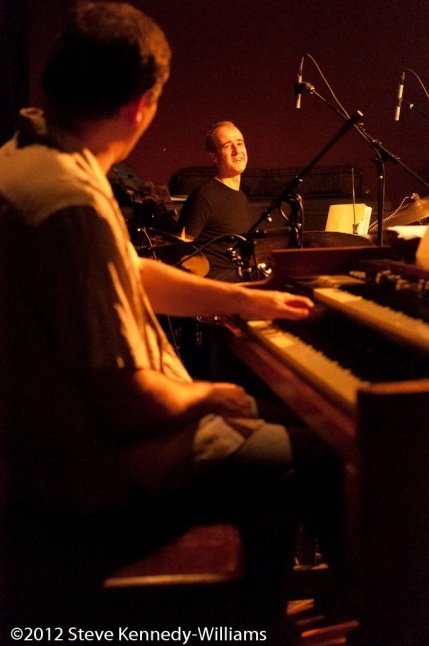 The show was LOUD – many tunes building quickly from either ambient searching or popping grooves to all out battles – Doria is a great player, ripping off fleet organ solos, often entwined with Hovitz’s dark Rhodes – trading lines or just inputting comments into the others solo. Horvitz had some furious playing and great solos. Previte was playing a storm from the get-go, and by the end he was just drumming like a bad season – quite impressive. Great music.